A little-known practice, not very complicated and with good effect on plant’s health and fruit quality. 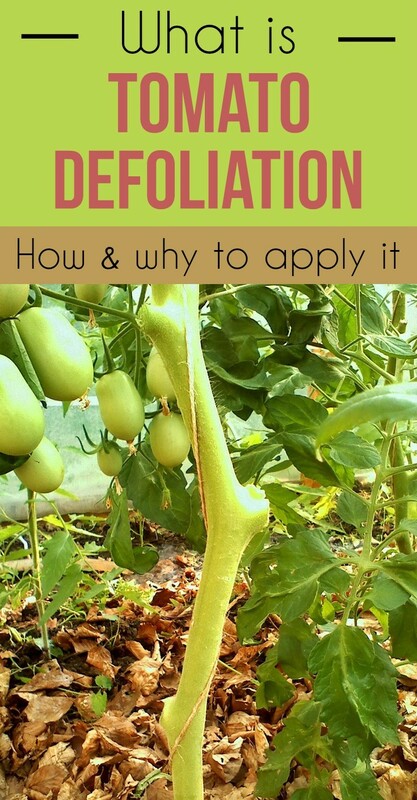 Tomato defoliation is the practice of removing the leaves from the base of the plant up to the first fruit level. This operation is performed when the basal leaves are aging, diseased or tend to touch the ground. As a rule, it coincides with the formation of the third fruit level. The leaves that make the defoliation need to be removed using a sharp knife, seeking that the “wound” created to be as small as possible. If you don’t apply treatments, the defoliation can be made in a clear day, in the morning, around 9 to 10 AM. Old and sick leaves from the base of the plant can become the source of the disease. The substances used in treatments hardly reach these leaves and they represent a “lair” for the phytopathogenic agents. Humidity and coolness that basal leaves maintain at the ground level aren’t good for the plant’s health. The airing produced by removing the basal leaves positively contributes to plant’s health.